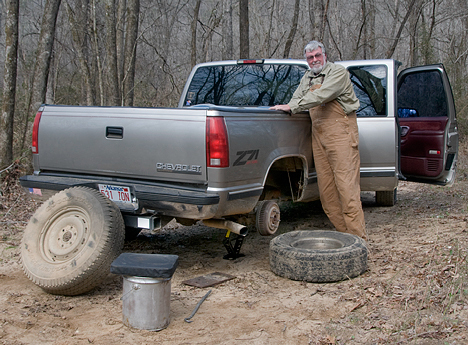 The price of this shot was a flat tire so far back in the boondocks, you go toward town to squirrel hunt. Turns out, it was worth the price. Sooner or later, it was bound to happen, and sure enough, the laws of probability prevailed. Application of these laws was manifested in deflation of the right rear tire of my venerable and otherwise faithful pickup. The cell phone said “no-service.” The GPS said “boondocks.” The map agreed. All that being so, the prevailing attitude had to be ” … this is no time to panic. We were after winter pictures. What we found can be seen on the Photo of the Week page at Corndancer dot com. See a cool low water bridge, a cool creek and a country road. Click here to go there. Oops. This is no time to panic. I had stopped to stretch my legs a quarter mile or so before deciding to leave the “improved” road. 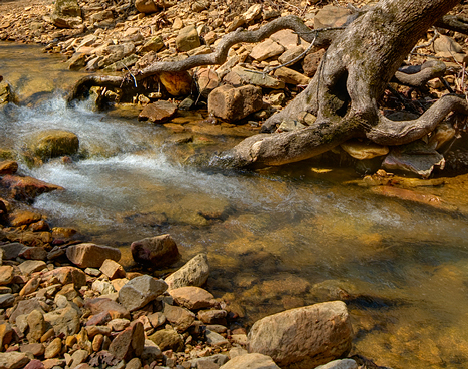 During this brief sojourn, I heard the tell-tale, siren song of rushing water. My heart thus quickened I got underway, forded a small creek and then made the fateful off-road turn. I found an appropriate place to stop, exited the truck and went to reconnoiter what I would shoot. When I returned to the truck, the right rear tire was as flat as a pancake. Since there was plenty of daylight left, I decided to get the shot first and then fix the flat. Under the best of circumstances, in these conditions, a good ol'-boy should be able to change a tire in thirty minutes or less. Given my advanced years, I added an hour, maybe a bit more to that estimate. I was about right in that guess. Here I had successfully dismounted the spare, after some bizarre body contortions. The first and foremost thing is to snake slither and crawl under the back of the truck bed to see if the spare is inflated. Yeah Buddy! It was. Then the fun starts. The jack and lug wrench are under the back seat of the truck, so first you remove three or four years of accumulated back seat stuff plus all the photo gear you believe you must have, but never use. That done, I find the jack and accessories are in unused condition, ready for a baptism of fire. So far, so good. Then jack up the truck from the back. 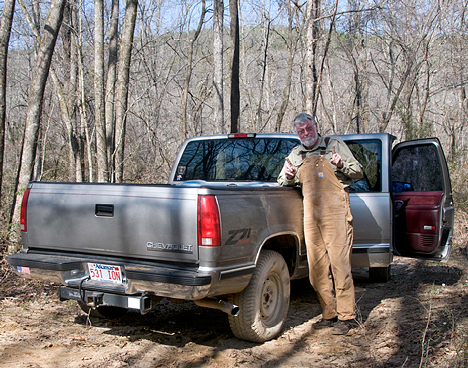 This requires one to get into the snake slithering position again to slide the jack under the rear axle of the truck. Slithering done, after a few minutes the truck was lifted a few inches. Thus configured, it is time to break the lug nuts loose. The lug nuts were last applied at the friendly local tire shop with an air impact wrench at what I figured to be approximately 10,000 foot pounds of torque. Breaking the lug nuts loose with your hands and arms only was not in the realm of possibility unless your name was Gargantua. I finally managed to break all of the infernal things loose by standing on the wrench and applying my 235 pound bulk to the tool with a vigorous downward stomp. Next, the spare must be dismounted. It is attached to the underside of the truck’s back side small pulley and cable assembly which holds it in place. The spare must be released by inserting a small rod through the rear bumper to access the pulley and unwind the cable which lowers the spare. I’m thinking that design engineers consulted the devil himself when they came up with this system. To lower the spare, it helps is if one has the arms of an octopus and the agility of a monkey. Though not so imbued, I managed to get the thing dismounted. But not before getting into the snake slithering position again. At last, it is time to put the spare on the truck. It's all over now but the grunting and groaning. There was plenty of both. One discovers when attempting to mount this spare tire to the waiting hub, that the combined weight of the LT265/75R16 tire and wheel is approximately the same weight as the door to the gold vault at Fort Knox. I can’t explain how I got it mounted without incurring bodily damage repairable only by extensive surgery, but I did. Thank the Almighty for small favors. It was like a chicken laying a square egg. It felt so good when it was over. Having a flat in the middle of nowhere is way on the far side from the best of all possible worlds. And not being exactly a spring chicken anymore, I can say that I approached the necessary job with some trepidation. However upon successfully completing the task, it felt pretty dadgum good. Gives one pause to think. A little adversity overwhelmed is a good thing. Nevertheless, I have high hopes that this is my dose of reality for at least the next few months. Yeah, right. Fat chance. But wait, there’s more. See our collection of high resolution versions of this week’s pictures here. The state of Arkansas calls this tree a "Look See" tree. 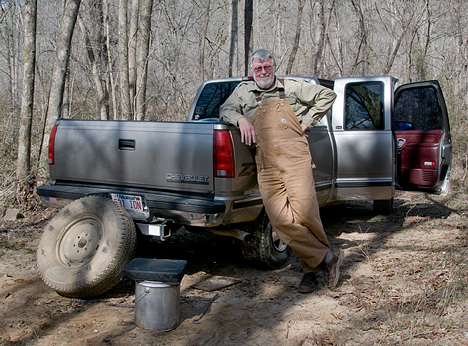 Olin Tucker, owner of the tree, and his neighbors around the Coleman, Arkansas community prefer to call it a "look-out" tree. 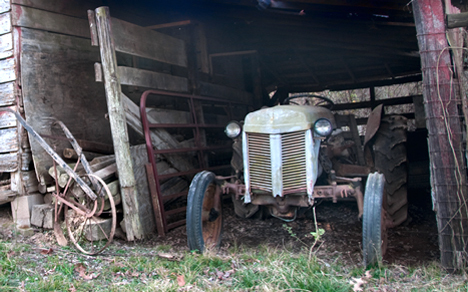 When I first made the acquaintance of Olin Tucker of the Coleman, Arkansas, community he had just completed pitching the virtues of a pair of used riding mowers he had for sale to a couple of “ol’ boys,” from nearby Dumas. They left without buying, which did not faze Olin one way or the other. 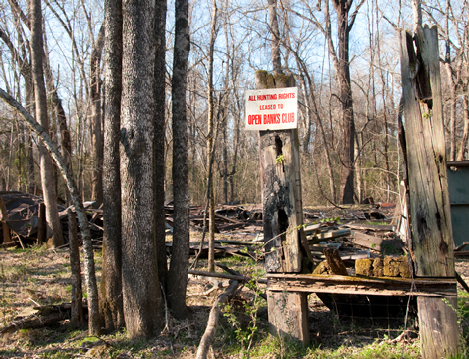 I approached him to ask for some information about a bizarre site I had photographed in the woods not far from his home on Arkansas Highway 83. Before we go too much further here, I need to advise you that this story came about as a result of a trip to shoot the 1874 model Selma Methodist Church in Selma, Arkansas not far from Coleman. Having shot it in March of 2009, I was overdue to shoot it again. One cannot overshoot a 136-year-old rural church. The church suffered some wind damage a year or so back and was in danger of falling. It has been saved and stabilized. The church is being restored to its former glory. 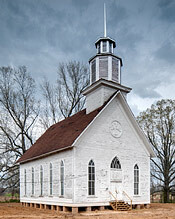 See pictures of the church and read the story on the Photo of the Week page at Corndancer dot com. Click here to go there, a good thing to do. When I asked Olin about what I had seen in the woods not far from his house, he told me he had not ventured that far and was unaware of what I had seen and shot. However, he immediately said, ” … what you need to shoot is that tree,” as he pointed to a fine old white oak tree on his property. Look out tree at Coleman Arkansas. The climbing pegs driven into the tree in the late thirties are still in the tree. There is a remnant of the platform left as well as an insulator for the telephone line used by forest rangers. 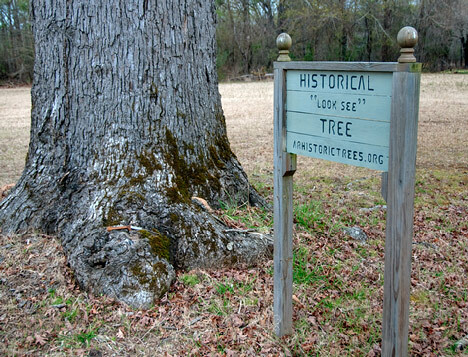 It turns out, in the late thirties, the tree was designated by the Arkansas Forestry Department to be a “look-out” tree. A look-out tree was a tall critter, normally strategically located on high ground. Forestry department crews would drive climbing pegs into the tree, similar to what you see in telephone poles. They also installed a platform and lines for a “hand-crank” telephone. Then during threatening seasons, forest rangers could climb the tree to “look out” for forest fires. In 2000 after Olin moved to his present home from Pine Bluff, as he admired his tree, it occurred to him that the tree sits precariously near a state highway and is, in fact, the the state highway right-of-way. That being so, he worried, that should the highway department decide to improve Arkansas Highway 83, the tree would probably be lost in the process. 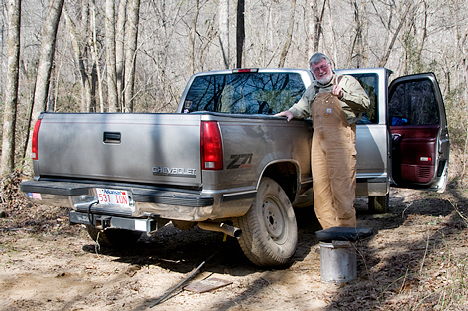 With the fear of losing his tree as a driving force Olin waded hip-deep into the process of finding a way to save it. 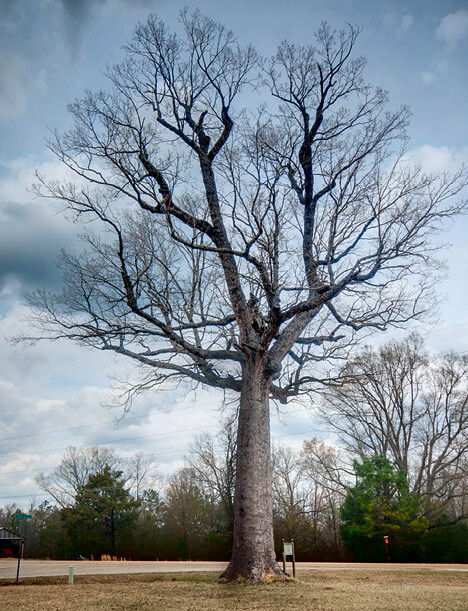 After no small amount of legwork, in 2006, Olin’s tree was properly admitted to and registered with the Arkansas Famous and Historic Tree Program. The tree will now be there until if falls of its on accord. Some things just work out well. It never ceases to amaze me what I find with a trip down a country road. Usually the more primitive the better. In this case, Holy Toledo, it looks like a ritual slaughter and display of old truck cabs. Or is it a Southeast Arkansas attempt at Stonehenge? Or Easter Island? Perhaps a ferrous oxide memorial in the making. Or aliens staking out a vacation spot. What mysterious force dropped these old truck cabs here. Where is Kirk when you need him? 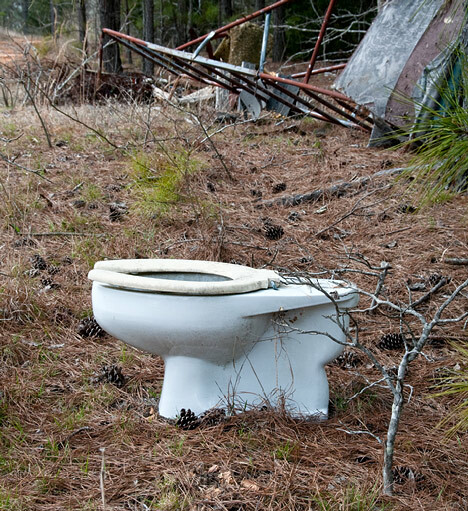 One of the more nefarious habits we sometimes see are impromptu dumps. Further down the road I encountered one. 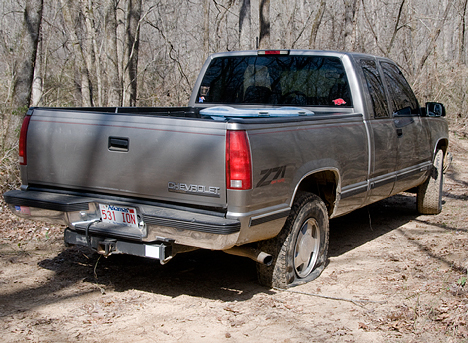 People drive their junk out into the woods and eject it, knowing it will never be seen by many. It this case, I rounded a curve to see a jettisoned porcelain convenience plopped on the side of the road. In the background was a decimated deer stand, and a pile of detritus including old bed springs and other household goods. Well folks, it ain’t hid no more. The world can see it. So there! What some litterbug had hoped would go unseen is now on the world-wide-web. I suppose you can’t help but snicker a bit when you see a lonely pot in a pile of pine needles. I did. Hope you did too despite the inappropriateness of the whole thing. Laugh while you can. Click here to browse through a gallery of 13 high resolution versions of this weeks pictures, including a couple not published. In spring and summer months leaves from trees and shrubs will make this view virtually impossible. Another example of stuff you can see in the winter and no other time. 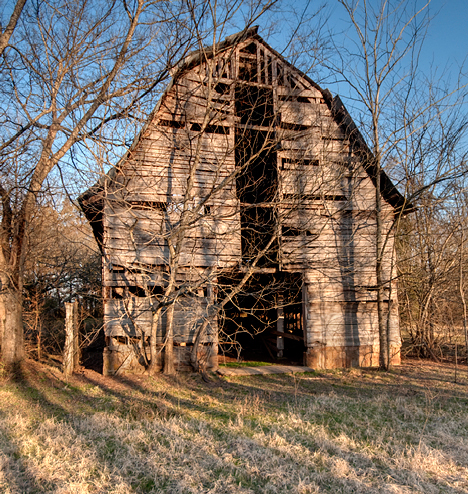 In late February (2010), Jon Phillipi and I, tooling west toward Houston, (Arkansas) on Arkansas Highway 113, noticed an old house on the south side of the road. Long since abandoned, and basking well in late afternoon sun, the house appeared to be a good prospect for a Weekly Grist picture. We passed it and I ventured one more backward glance and noticed a large barn south of the house. We duly noted the location as a prime prospect and continued west to Houston where we would shoot the former Houston Methodist Church, a popular target for photographers. It's not a old barn. It's an old gin. 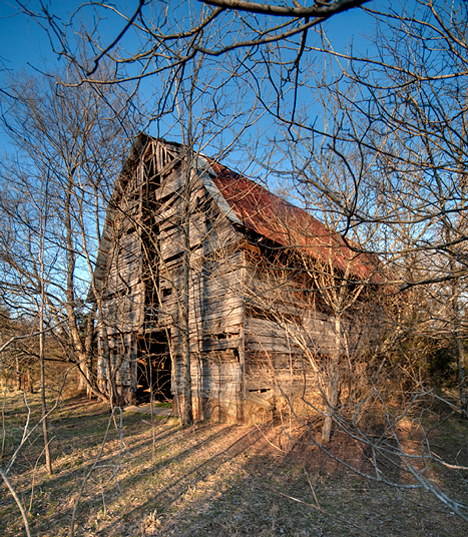 Before we venture too much further, we need to tell you this barn story started on the Photo of the Week page at Corndancer dot com where we visited what we thought was an old barn at Ladd, Arkansas. 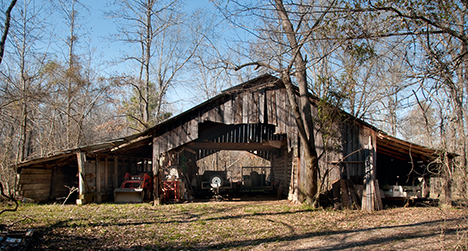 Turns out, it is not an old barn, but an old gin. A last minute infusion of facts saved our bacon from the embarrassment of publishing a falsehood. Nothing like the facts to clear the air. Like the barn at Houston the gin has seen better days but still is very interesting. See the old gin at Ladd here, outside and inside. Back to Houston. With a sufficient amount of pixels “in the can” from the church at Houston, we headed back east toward the Delta, our home. By the time we saw the house and barn again, the late evening illumination was nearing perfection. Coming back to shoot the barn ceased to be an option. The light was right and the time was now. I ventured to the nearest neighbor’s domicile and asked if the barn was on their property. A friendly young man informed me that it was not their property and belonged to unknown persons who “ … lived up north,“ meaning north of the Mason Dixon line. The barn is one of the tallest we've seen. In all likelihood, with this large capacity loft to store hay, the barn was part of a large livestock operation. This of course is music to a trespassing photographer’s ear. The owner ain’t gonna show, so fire away with reckless abandon. That was the good news. The bad news is we know little about the old barn except for the fact that it looks really great in late afternoon February sun. There may be some clue as to when the barn was either built or was improved. 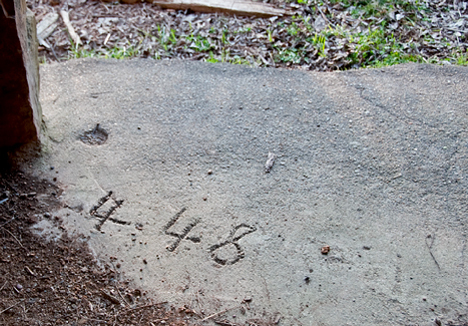 Hieroglyphics we interpret to be 4-48 were carefully scratched into wet concrete at the west entrance to the barn. In the final throes of a winter somewhat colder than normal, the southeast Arkansas landscape still carries its winter mantle of gravy brown. 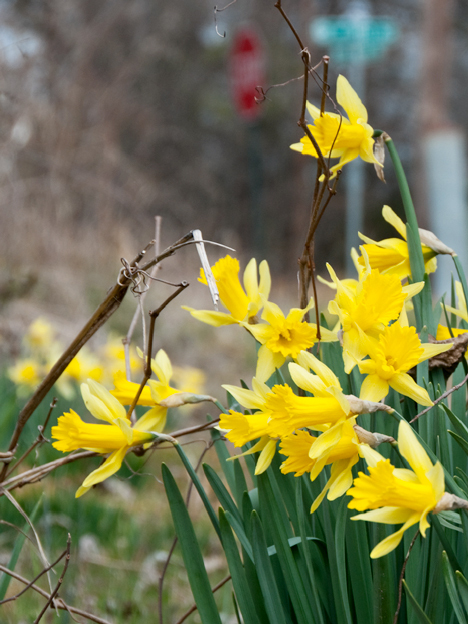 Paying little attention to these environmental conditions, the flowers which announce spring will wait no longer. 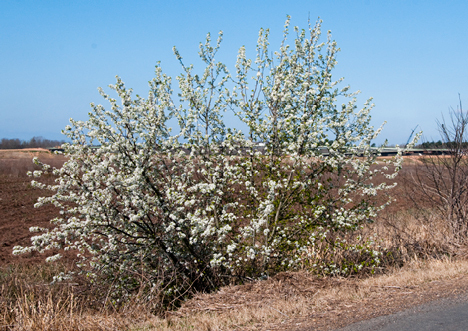 A flowering bush an/or stunted tree seems healthy enough on a bleak roadside. 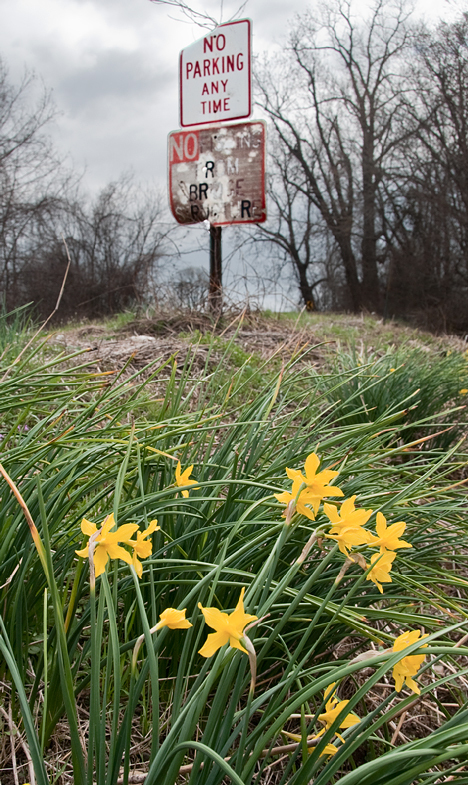 A bare field to the left and a construction project in the background lie in contrast to the rites of spring. Jonquils, Bradford Pear trees and miscellaneous and sundry fruit-bearing trees now generously dot the landscape, portending quick relief for denizens of these whereabouts who have had all the winter they can abide. Friends to the north, take heed. We are sending these favorable conditions your way. I've heard it said that it takes two uglies to make a uugly (pronounced "you-glee"). These signs are the manifestation of that rumor. These jonquils (or are they narcissus?) are providing a modicum of temporary relief. When they're gone, it's back to uugly. The blog picture processing procedure somewhat degrades pictures rather than being neutral or enhancing them, so to show you the best pictures, we make a weekly post to a higher resolution gallery. In this gallery, you’ll see all the pictures on Corndancer and Weekly Grist, plus those we closely considered, but did not publish. This week, there are 18 cool shots to see. Click here to go there.